FOXBOROUGH -Matt Triveri’s tenure at Mashpee High has been marked by transcendent running back production year-in and year-out. And, while he’s still got another year with a pretty good one in Devaun Ford, the coach didn’t hesitate to put him in the ranks with past legends. “He’s right up there with Jordan [Keli’inui], DeShaun [Dias], Jared Taylor,” Triveri said of his workhorse back, who worked through some early injury to finish with a game-high 24 carries for 177 yards and a touchdown, and added three catches for 45 yards and another score in the Falcons’ 22-16 win over Blackstone Valley Tech. 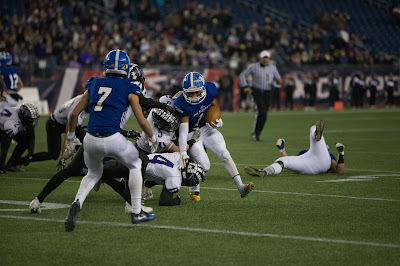 The win handed Mashpee the MIAA Division 7 State Championship at Gillette Stadium, the program's third state championship in a row. The Falcons have now won three straight state-wide titles at Gillette Stadium, and four Super Bowls in the past seven seasons, dating back to Jared Taylor’s epic 308-yard masterpiece in their Division 4A Super Bowl rout of Cardinal Spellman in 2011. But before Mashpee could bask in the luster of more championship hardware, and before Ford could permeate himself in the annals of the school’s all-time greats, the Falcons had to hold on for dear life. Early in the fourth quarter, Valley Tech’s Reese Hendricks (11 of 19, 171 yards, TD, 2 INT) set up a scoring drive with two big completions to Conner Christensen (four catches, 53 yards) for first and goal at the three yard line. On fourth and goal from the 6, Hendricks fired a laser to Jordyn Amero down the right seam for a score, then lofted one to Christensen again at the goal line on the two-point try, to cut Mashpee’s lead to 22-16 with 7:47 to go. Only in the final minute of play, when sophomore linebacker Kendall Rose stepped in front of a Hendricks pass over the middle for the quaterback’s second and final interception of the night, was the lead finally in hand. “We knew we had to stop them, and once I caught the ball I knew it was over,” Rose said. Mashpee took the opening drive the length of the field to start this one off, going 88 yards in 11 plays and capping it with a one-yard Jacob Johnston (10 of 11, 161 yards, TD) blast for an 8-0 lead following a successful two-point try. The Beavers dug into their bag of tricks to pull even late in the second quarter, with a double-reverse pass putting them into the red zone, a Hendricks screen to Brandon Lira giving them first and goal at the 3, and then a Hendricks scramble over the pylon tying it all up at 8-8. Mashpee got down the field in a hurry on the ensuing drive, with a big Cam Kergo (six catches, 103 yards) catch, preceding what will go down as one of the most controversial calls of the entire weekend’s slate of games at Gillette. Johnston’s pass to Ford in the end zone, with :25 left in the half, was initially caught, and then the ball popped out of his grip. Referees ruled, however, that Ford had possession long enough to complete the score. Johnston then hit Michael Barrows on a lob for a two-point try and 16-8 lead. In a classic Belichickian two-fer, the Falcons came out with possession to start the second half and put up more points to take their largest lead of the game. Ford blasted up the playside A-gap to start what would be his longest rush of the night, and after blowing through a tackle coming across the line of scrimmage, the junior reversed direction to the right sideline and turned the corner, hitting the afterburners for a pretty highlight-reel touchdown and 22-8 lead that would prove to be just enough.